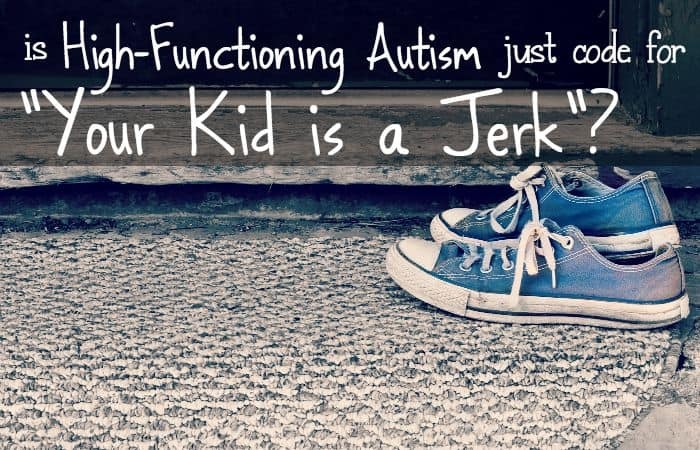 Is High-Functioning Autism just code for “Your kid is a jerk”? Recently, there’s been a lot of discussion about high-functioning autism in my house. The last time my son took an extended-vacay at the mental health facility, the director of the youth program mentioned that this might (key word: MIGHT) be a possible diagnosis for my son and thus, the reason behind his violent outbursts. But, then I started to learn more about it. How it’s marked by all sorts of delays in development (which he didn’t have) and the social disconnect (which he does have significant problems with). If he doesn’t fit the pattern, I’m beginning to wonder, is High-Functioning Autism just code for “Your kid is a jerk”? Because, really, is this something he’s really challenged with, or are we just giving-up, since he won’t change his behavior? I just can’t tell. Clearly, I’m no pro at the whole psychiatry/psychology thing, although we’ve been through all types with my son. We’ve had art-therapy, play-therapy, psychiatric evals, and stays at every type of facility known to man. At every occasion, after about the first year after we adopted him, I asked “you don’t think he’s–autistic, do you? Maybe he has aspergers?” Because, if we had something like that, it might explain some of the things he does and, though it probably won’t change anything for him, it would give me peace of mind. About two years ago, though, I gave up. I had a baby daughter to deal with and he just wasn’t going to change, even if he got a new diagnosis (because he already has several, just not autism). So, I needed to focus on the kid with whom I could have an affect–the baby. My husband picked-up where I left off. He started taking our son everywhere and doing everything with him. 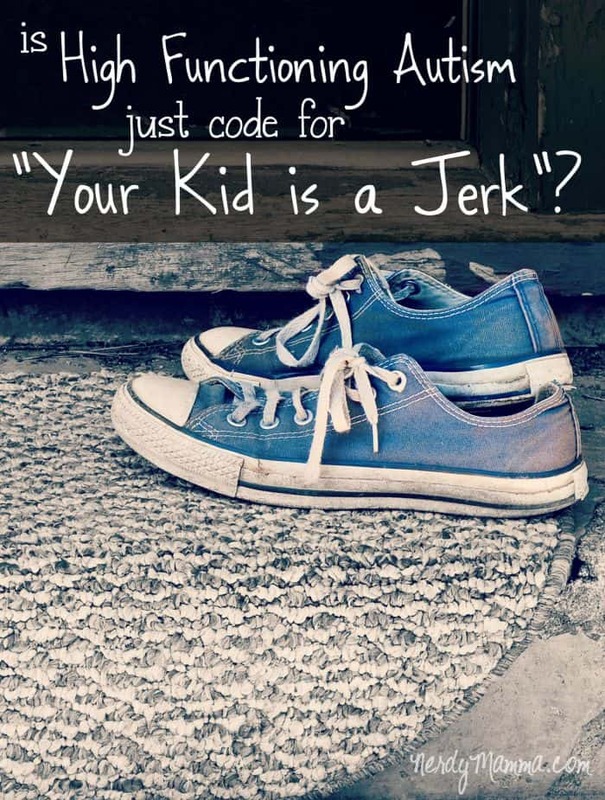 It’s just too hard for me to have the baby in the car while the tween/teen son is screaming, kicking, hitting, throwing things, and trying to jump out of the car. Just dangerous. So, the hubster stepped-in. Good man. And the questions stopped being asked, because his approach is different than mine. So, when this new potential diagnosis reared its head about a month ago, I was floored. REALLY?! I FREAKIN’ ASKED THIS ABOUT A MILLION TIMES! I think I know what changed, though. I think I was just a year or so ahead of the curve. I believe my son just got on the last nerve of the folks there at the mental health facility. I think they are grasping at straws, much as I was. I think they are out of ideas. So, they threw this at him to see if it sticks. This kid is really a jerk–and doesn’t seem to empathize with others, and has all sorts of other issues that we just can’t explain other than he’s a jerk. Well, maybe, if we tell the parents he’s got some real problem, they’ll stop bringing him here? Can we tell them he’s possibly autistic? But he reads really well and can have conversations when he’s not angry (although that’s not often). So, “high-functioning autism”. That’s the ticket! Now we’ll never see him again. Get those parents on the phone! It’s not fair, and I hate to see others give-up on him, but I already gave up on the idea that he would change, so I can’t be casting stones. Is that what’s happening? Is he really challenged with this form of autism, or are they just sending us down another path to get him out of their hair, just because he’s a jerk and doesn’t want to be nice? I don’t know…I just don’t know.